In the same twelve-month period, the NZX50 Capital Index, which doesn’t include dividends, appreciated by 1.4 per cent while the NZX50 Gross Index, which includes dividends, was up 4.9 per cent. There have been remarkably similar movements in house and share prices over the past decade. Residential property and share prices declined in 2010 but between 2012 and 2017 the two asset classes experienced strong price growth, even though the Auckland housing market began to moderate in 2017. Over the past decade New Zealand house prices appreciated 69.7 per cent, Auckland 95.9 per cent, the NZX50 Capital Index 105.1 per cent and the NZX50 Gross 224.5 per cent. 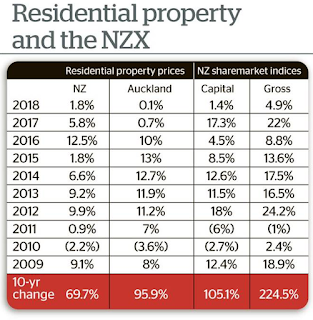 Based on these figures, the NZX appears to have outperformed residential property but those numbers should be treated with caution as there can be huge variations between individual houses and between NZX index companies. Many houses and shares have either underperformed or outperformed these industry figures, often by wide margins. 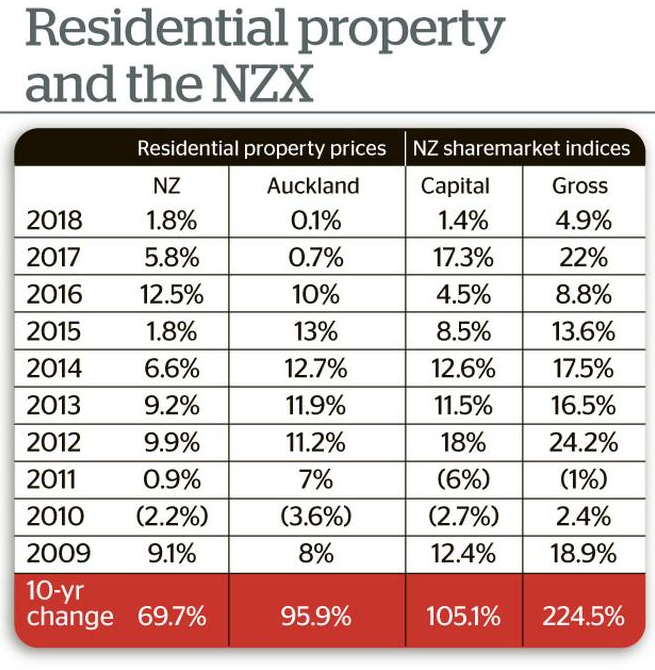 The important message from these figures is that even though the NZX outperformed houses between 2008 and 2018, the latter created far more capital wealth because residential property is the main investment of most New Zealanders. In other words, a 5 per cent rise in house values creates more absolute wealth for New Zealanders than a 20 increase in the NZX50 Capital Index. However, listed companies have probably generated more income over the period because most NZX index companies pay fully imputed dividends. Residential property and shares have performed extremely well over the past decade because of low interest rates and the money printing policies of global central banks. This has allowed individuals to borrow cheap money to purchase houses, and listed companies to raise debt finance to buy back shares and make acquisitions. New Zealand house prices are highly elevated, as illustrated by the 15th annual Demographia International Housing Affordability Survey released this week, which covers 309 urban markets. Housing affordability is determined by dividing the median house price by the median household income. A multiple of 5.1 and above indicates severe unaffordability. Hong Kong is the most unaffordable market with a 20.9 multiple, followed by New Zealand with 6.5 and Australia, 5.7. The United States, with a 3.5 multiple, has the most affordable housing market of those included in the Demographia study. Seven of the eight NZ regions are severely unaffordable with multiples of 5.1 & above. These are: Tauranga (ranked 302 out of the 309 Demographia regions for affordability); Auckland (301); Hamilton (278); Napier-Hastings (274); Wellington (278); Dunedin (264); and Christchurch (240). Palmerston North, which is ranked 224 with a 5.0 multiple, is the only NZ region that isn’t in the severely unaffordable group. Further substantial upside to New Zealand housing prices is probably limited because of the unaffordability of the country’s major urban markets. Another potential negative impact on the housing market is the Reserve Bank’s Capital Review, which was initiated at the end of last year. Under its main Capital Review proposal, the Reserve Bank is planning to raise the minimum Tier 1 capital or equity requirement (as a percentage of risk-weighted assets) of the four major Australian-owned banks from 8.5 per cent at present to 16.0 per cent by 2023. It is also recommending an increase in Tier 1 capital for the other banks, from 8.5 per cent to 15.0 per cent over the same period. This is a massive change which will require the major Australian-owned banks to raise additional capital of nearly $15b over the next four years. ANZ is expected to require an extra $4.7b in equity, Bank of New Zealand $4b, ASB $3.4b and Westpac $2.7b. UBS believes these capital requirements will have a negative impact on interest rates, with NZ mortgage rates potentially rising by between 0.80 and 1.25 per cent. The Reserve Bank is calling for submissions by May 3rd and is expected to receive many arguments against its new Tier 1 capital requirements. Former Reserve Bank official Michael Reddell argues that the numbers used to justify the Tier 1 capital increase “are really just plucked out of the air”. The outcome of the Capital Review will have an important impact on interest rates and the housing market. The other important influence on residential property is the ageing of the baby boomer generation, born between 1946 and 1964. This topic has been extensively covered in research studies released by Fannie Mae, the US government-sponsored enterprise that is a major supplier of mortgage finance. A recent Fannie Mae paper “The Coming Exodus of Older Homeowners” was written in association with Professor Dowell Myers of the University of Southern California. The paper’s main thesis is that individuals born between 1946 and 1964 occupy 32 million homes in the US and those born before 1946 own a further 14 million. These 46 million residential units represent over 50 per cent of all US housing stock. Based on statistics for the 2006 to 2016 period, a quarter of those between 65 and 84 exit the housing market, while 69 per cent of those over 84 sell their homes. Although there is no sign of mass selling to date, the Fannie Mae study notes: “With the oldest boomers now advancing into their 70s, the beginning of a mass exodus looms on the horizon, spurring fears of a bursting of the ‘generational housing bubble’ in which home ownership demand from younger generations is insufficient to fill the void left by multitudes of departing older owners”. Although boomers are not selling yet, there is a definite trend for this age group — and those born before 1946 — to move from large metropolitan cities to smaller areas with warmer climates. Consequently, it is not surprising that Tauranga has the country’s least affordable residential property according to Demographia as New Zealand home owners are also ageing. But it is not all gloom as far as housing markets are concerned, as another Fannie Mae study notes that millennials, individuals between 23 and 38, have a strong desire to enter the home ownership market. However, this age group is strongly influenced by affordability, which is why the Demographia survey released this week is an important indicator of long-term New Zealand house price movements. Brian Gaynor is an investment analyst and the Executive Director of Milford Asset Management. This article originally appeared in the NZ Herald.